Residents of Abuja, the Federal Capital Territory (FCT) have been commended for their peaceful conduct during the just concluded Area Council elections. Security and Civil Defence Corps (NSCDC), Solomon Iyamu, who gave commendation, the residents have again demonstrated their commitment to promoting peaceful coexistence in the Territory. Speaking with newsmen on the preliminary evaluation of exercise, the NSCDC boss repeatedly praised the peaceful nature in which FCT residents conducted themselves before, during and after the elections. Iyamu noted that the election was generally peaceful, based on the report he got from his field officers. He added that many residents actually came out to perform their civic duties of voting for their choice of candidates. He described the existing synergy between the NSCDC and other security agencies, such as the Directorate of State Security (DSS), the police, the Nigerian Prisons Service and the Immigrations Service as cordial. 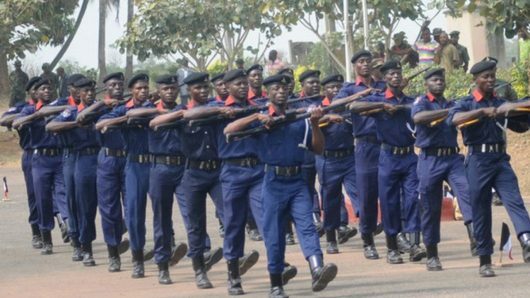 This, the FCT NSCDC boss said has noted enhanced work of the Corps, but has greatly contributed to the relative peace in the Territory. However, our correspondent reports that low turnout of voters was the major challenge experienced during the area council elections held across in the six area councils of Federal Capital Territory (FCT). It was observed that most of the polling stations especially those within the Federal Capital City (FCC) recorded very low voter turnout during the exercise. For instance, a visit to some of the polling units, located at Garki village, Apo Resettlement, LEA Primary School, Pigba, near Apo Mechanic village, Kabusa, and Gwarinpa, Life Camp, in Abuja Municipal Area Council (AMAC), and Dutsen Alhaji in Bwari area council, revealed that only a handful of residents queued up to cast their votes. Also,in some of the polling stations, such as Kabusa (Tipper Garage) and Life Camp polling units, the electoral officers were almost idle, waiting for voters, when our correspondent visited the areas. Similarly, at polling stations inside Government Secondary School, Kabusa, voters were seen waiting for the arrival of voting materials, at about 11oclock in the morning, when our reporter visited the area. Some residents of Apo Resettlement said the seemingly voters’ apathy experienced during the area council elections might not be unconnected with the outcome of last presidential election. According to them, many residents in the area have been demoralized by the outcome of last presidential election. This, they said is because it was not what they expected that was announced. So, this has lowered their interest in coming out to vote.